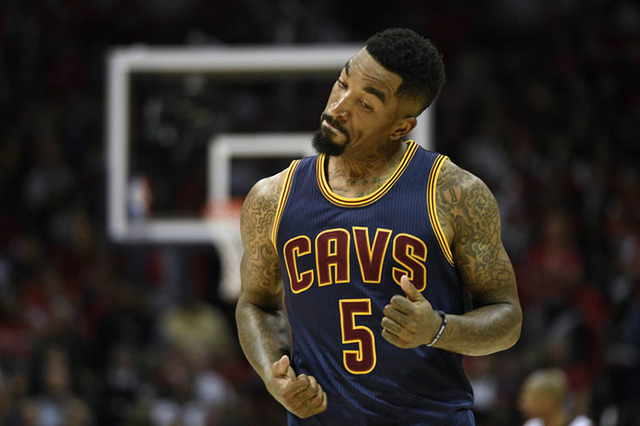 Cleveland guard J.R. Smith exploded for 28 points, fueling a 97-89 Cavaliers win over the Atlanta Hawks on Wednesday in Game 1 of the Eastern Conference Finals at Philips Arena. 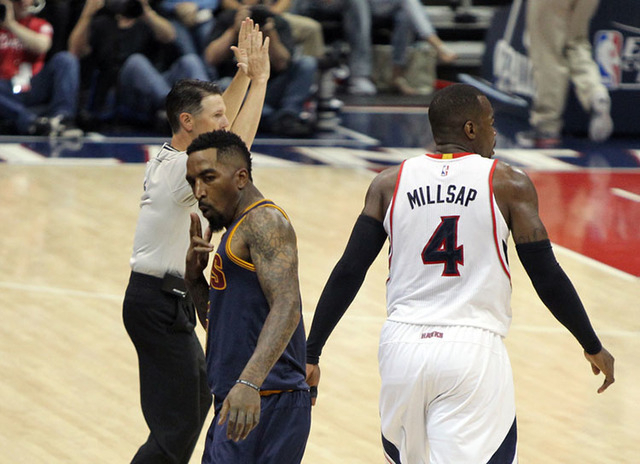 ATLANTA — Cleveland guard J.R. Smith exploded for 28 points, fueling a 97-89 Cavaliers win over the Atlanta Hawks on Wednesday in Game 1 of the Eastern Conference Finals at Philips Arena. Smith came off the bench to hit eight 3-pointers, including back-to-back 3s in the third quarter that helped Cleveland break open a close, back-and-forth game. Game 2 is Friday in Atlanta. Forward LeBron James added 31 points for the Cavaliers. James is looking to make it back to the NBA Finals for the fifth straight season. Point guard Jeff Teague led the Hawks with 27 points. 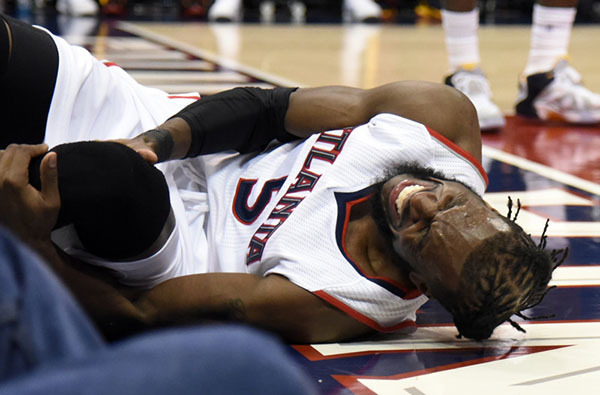 To make matters worse for the Hawks, versatile forward DeMarre Carroll went down hard on a drive late in the fourth quarter and had to be helped to the locker room. Carroll has been one of the Hawks’ top players in the playoffs and was the primary defender on James. 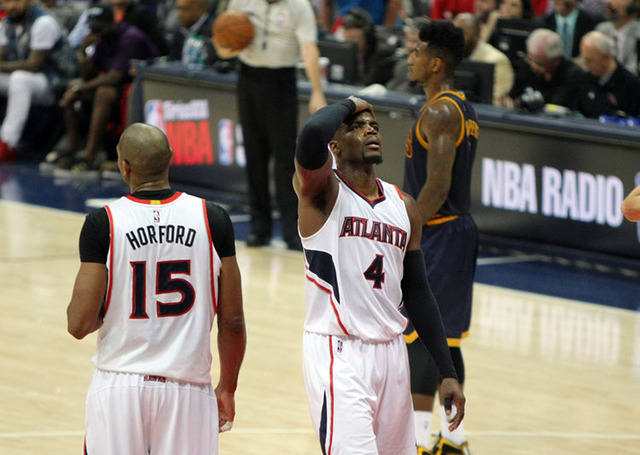 Atlanta was already without defensive stopper Thabo Sefolosha, who was lost for the year in March to knee surgery. Cleveland led 85-69 with 10 minutes left in the fourth quarter before Atlanta mounted its last charge. Hawks guard Kyle Korver hit a corner 3-pointer and point guard Jeff Teague followed with a layup to trim the deficit to 11 and force a Cleveland timeout. The Hawks closed to 91-87 on a fast-break layup by forward Kent Bazemore, who provided a spark off the bench in the second half. 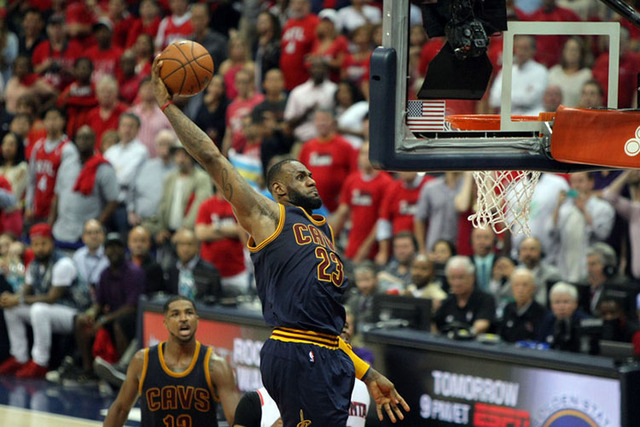 But James broke free on Cleveland’s ensuing possession and threw down a one-handed dunk to slam the door on Atlanta’s comeback hopes. Cavs point guard Kyrie Irving, who has been battling ankle and knee ailments, started and played 27 minutes. He finished with 10 points and six assists. The Cavaliers fought off a raucous crowd at Philips Arena that was hosting its first conference finals. They dominated the backboards and stymied the Hawks’ offense in the second half. Cleveland used its superior size to outrebound Atlanta 49-36. The score was tied 51-51 after a back-and-forth first half. Teague got off to a hot start, scoring 17 in the first 24 minutes. Smith came off the bench for 11 first-half points, including three 3-pointers. 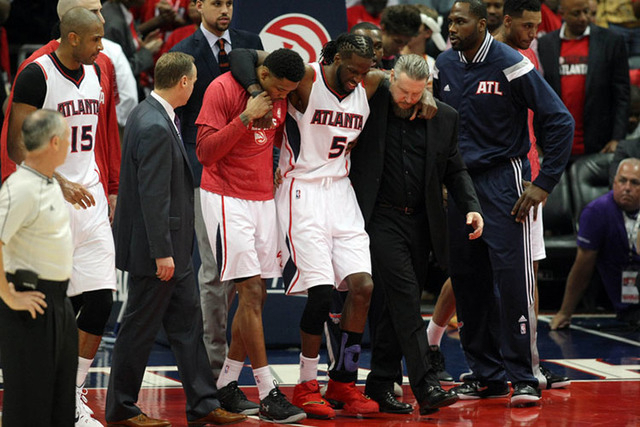 The loss of Carroll will be hard to overcome for the Hawks. Carroll, who will be an unrestricted free agent this summer, held his own against James in the early going. But the Cavs began running pick-and-rolls at him, forcing the Hawks to switch smaller guards on James, who capitalized by getting into the paint for easy buckets. James had 14 in the second quarter. NOTES: Cleveland PG Kyrie Irving, who left Game 6 of the Cavs’ series with the Chicago Bulls with knee and foot injuries, told reporters Wednesday that the six days of rest did him well and he felt good heading into the Eastern Conference finals. Irving is dealing with a right foot sprain and left knee tendinitis. … Atlanta G Kyle Korver, considered one of the best shooters in the NBA, made only six of 22 shots in the final four games of Hawks’ series against the Washington Wizards. 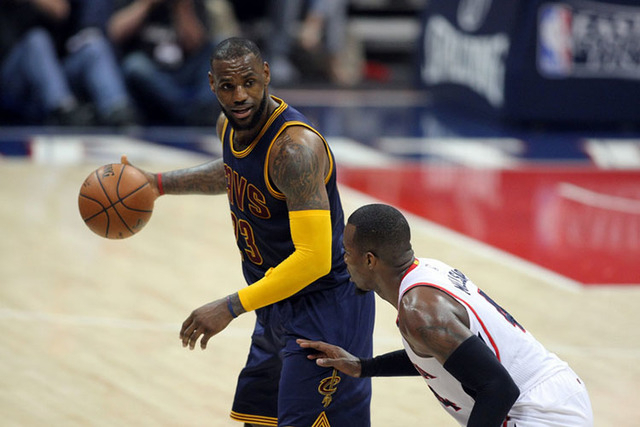 … The Hawks won three of four meetings with the Cavaliers in the regular season. … Cleveland G Iman Shumpert played college ball at Georgia Tech.